S.O.F.T. 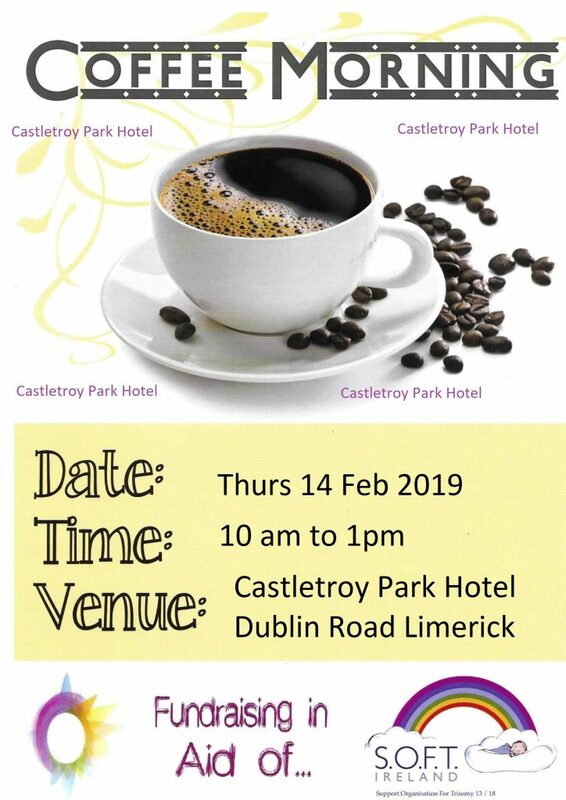 Ireland are organising a Coffee Morning on Thurs 14 Feb 2019 in the Four Star, Castletroy Park Hotel, Dublin Road, Castletroy, Limerick in the Conservatory from 10am to 1 pm approx.. The event is sponsored by The Castletroy Park Hotel. The hotel is situated off the M7 Dublin motorway, adjacent to the University of Limerick and minutes from Limerick centre. It offers an excellent starting place to explore Irelands Wild Atlantic Way or the Ancient East. A big effort is made by the staff and management to make this a success. Tea/Coffee & beautiful pastries / desserts sponsored on the day by the hotel and staff at the Castletroy Park Hotel. 10am to 1 pm approx..